Well it’s that time of year again everyone! I hope you’re ready for pixelated images, run-on sentences and stories of how you should have been here last week. The start of our 2018 season has been a bit of a doozy, if I was a betting man I would have guessed we would have been standing on ice for opener this year, but luckily I’m not. I was really amazed at the speed of which the ice melted away this year, opener was the 12th of May which is one of the later dates that it will fall on, we needed every extra day we could muster this year. Official ice-out was Wednesday the 9th, from my vantage point I would say it was more like Thursday the 10th at around 6-am, I’m pretty sure I saw a slush flotilla out front that morning, but hey, my eyes aren’t what they used to be. Pictured below from L to R: Dan Becker, Wayne VanGorp and Loren Becker from Cedar Rapids, IA showing off a days catch. Russ Havlik, Mike Burnside from Cedar Rapids, IA and another shot of Dan Becker and a dandy over. This is going to be a special season for us here at Big Rock, we have had some much-needed improvements to the harbor, boathouse and throughout the resort, I won’t bother you with all the details in this blog, but coming soon I’ll get you all up to speed, for now let me say that we are super super excited and cannot wait to share the resort with you this and the coming years. Now, let’s talk Walleye! With water temps just north of an ice-cube you can pretty much guess how the first couple days of the Walleye season went, fish were being caught, but they were biting light. Walleye tend to be pretty lethargic in the cold water, the usual feeding frenzy after spawning wasn’t really happening and to top it off the 40 degree water put the brakes on the spot-tail shiner spawning run, which, in my opinion is the only ammo to use this time of year. Pictured Below from L to R: Russ Havlik from Cedar Rapids, IA with a couple beauties, Kevin Peach from Grand Forks, ND, Loren Becker from Cedar Rapids, IA and David Beniak from Eden Prairie, MN. lots of smiles to go around! Weather improved rapidly after the weekend, early last week we were met with light winds, lots of sun and temps that had me running around without shoes, I’m now sporting a nice farmers tan. Consistent weather throughout the week led to better fishing, we didn’t get the wind we would have liked but stable is always a good thing. Anglers this time of year almost exclusively fish with jig and a minnow with larger minnows out performing smaller, this is really when the shiners umm, shine, they’ve just been hard to come by, if you were lucky enough to find some of buy some of the limited supply we had you caught fish, and the vast majority of the fish were big. Oodles of slot fish and many 26+ inch fish were caught during the week, after the big girls spawn they tend to hit the buffet line to recharge, having a juicy shiner on the end of your line was the ticket. Pictured below are a handful of teaser images of our harbor renovation, more to come! we hope you like it. 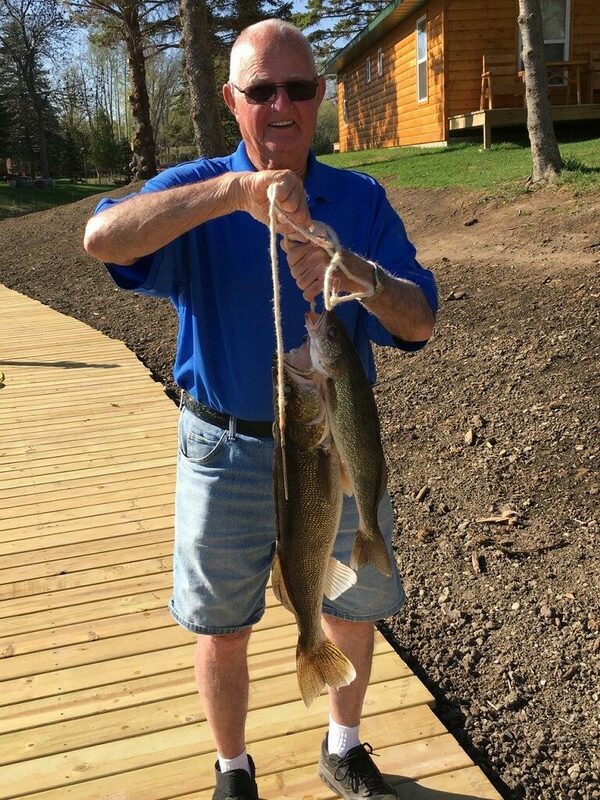 This time of year can be unique, we had many guests that were unable to catch a single fish they were able to keep even though they reported catching dozens of Walleye. 22-25 inch fish have really been on a tear, while lots of fun to catch they don’t make it to the frying pan. With the cool water temps, look for fish in shallow water and in areas where vegetation is starting to grow, warmer water and extra oxygen is where they are going to be. Memorial day is just over the horizon and we have a full house of guests and owners who will be around trying their luck on Leech Lake, jumping in the swimming pool and eating ice cream cones. We will be having our annual potluck get-together Sunday afternoon at 3pm, if you’re in the area stop by and have a bite with us!